This write up will contain spoilers, my friends, so if you want to retain some mystery, don’t continue beyond the poster and the break below it. 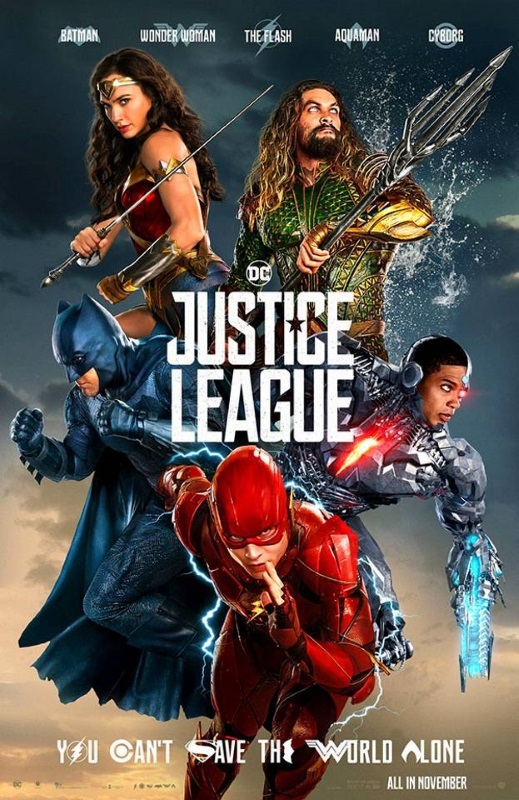 For the two people left in the comics world who haven’t heard, Justice League sees Batman and Wonder Woman bringing together a team of lesser known heroes in order to save the world from the most insidious threat faced by any sci-fi/superhero film: a terrible CGI villain. There’s the usual two heroes meet and fight before becoming friends type of scene as the team grows but thankfully they’re kept brief; Cyborg, Flash and Aquaman each get enough backstory so that you understand who they are without really needing an origin movie, though Aquaman’s recap suffered from the dialogue between him and Mera (who isn’t actually named on screen) being submerged by the rushing ocean around them. The bad guy, Steppenwolf, gets a potted history as well, and a lot of nonsense about using three Mother Boxes to form “The Unity” which will destroy the world. He’s defeated by the Last Alliance of Elves and Men the Amazons, Atlanteans and Men who each take a Mother Box that lays dormant for thousands of years before waking up after Superman’s death and summoning Steppenwolf back to destroy the world. The League band together, use one of the Boxes to resurrect Superman, then defeat Steppenwolf, forcing him to flee once more. Plot-wise, it’s fairly standard stuff, but each of the main characters, perhaps with the exception of Cyborg, is engaging enough that you can happily ignore the short-comings of the story. Batman and Wonder Woman are both handled well as they carry the majority of the film, and it’s good to see the interminable gloom and doom of previous Snyder films lifting; it doesn’t go away entirely, but there are definite funny moments (almost certainly down to Joss Whedon and his dialogue/reshoots) that allow you to actually like the characters. One Batman scene stood out for me – the climactic fight saw Batman swing into battle against Parademons, against the backdrop of the Mother Box altered landscape. Up until this point, we’ve only seen Batman fighting his usual rogues gallery who, though weird, are all human. Seeing him confidently go up against aliens and Gods reinforces just why he’s a member of the League. Poor old Cyborg suffers not from any acting deficiency, but the fact that, apart from half his face, he’s entirely CGI – and sometimes it looks like his face is CGI, too. The Flash is easily the most fun character, happily learning to work with others while enjoying his powers, while Aquaman, once past the gruff exterior, turns out to be a hoot as well. After Superman returns and regains his sense of self, it’s nice to see a happy, smiling Superman for the first time in the modern DC films – even his suit is a darn sight brighter than it was in Man of Steel and the dreadful Batman v Superman. He wants to help people and is willing to leave a battle with Steppenwolf in order to save civilians – something we saw nothing of in previous outings. And Steppenwolf . . . good lord, he’s rubbish. The film world’s at a point where truly great CGI is possible – the recent Planet of the Apes films instantly spring to my mind – and it’s just such a shame to see something that looks like an X-Box cut scene character wandering around trying to hit the heroes. As to his motives . . . there’s a single mention of Darkseid and the New Gods, so if you have no idea who he is, you won’t learn anything; he’s just a generic, poorly CGI’d bad guy for the League to form up to defeat. And no-one seems to question why the Mother Boxes woke up after Superman’s death – why didn’t they wake up before he even arrived on the planet? There are two post ending scenes; the first mid-credits shows Flash and Superman racing each other, a lovely call back to the many races they’ve had in the comics over the years, and it shows both of them enjoying themselves. The second is after the credits and shows a newly escaped Lex Luthor teaming up with Deathstroke and planning to form their “own league” – ironic as that’s the only mention of the League in the entire film. Nearing defeat, Steppenwolf shouts something like “Who dares stand against me?” which would have been a great lead in for Batman or Wonder Woman to say “We do: the Justice League.” or some such line, but no, “Justice League” isn’t spoken once. It’s not terrible – it’s much better than MoS or BvS or even Suicide Squad but it falls far short of Wonder Woman. Having mentioned Wonder Woman, there’s been the recent controversy over the Amazon’s showing a lot more skin in this film than in WW and one of the rationalisations I read was that the Amazon warriors rush to battle in leather armour because that scene was set in the past, thus explaining why they didn’t have metal armour. That misses the point that they had swords, shields and arrow tips of metal, thus proving they understood working with metal; why wouldn’t they fashion practical armour out of the stuff? You know, like the Atlantean and human males had done before jumping into the same battle? It has it’s failings, but on the whole, it’s not too bad; it gets three classic JLA logos out of five from me. Posted on Monday, November 20, 2017 Monday, October 15, 2018 by GaryPosted in ReviewTagged Aquaman, Batman, Cyborg, Flash (Barry Allen), Superman, Wonder Woman. Still sounds like a well-orchestrated dumpster fire to me. A nice-looking dumpster fire, but a dumpster fire nonetheless. I will give a rare bit or praise that it seems like things are finally starting to lighten up over there though. If they can build off that and keep that new tone, they might do okay. 3 out of 5 is fair to my mind – it’s got a few plus points, and a few minus ones, but on the whole it was okay, I thought. I’m reading that the money/viewing numbers aren’t so good, however, so who knows what will happen to any of the other planned films. I think Aquaman’s safe as it’s finished shooting but anything else is up in the air at the moment.